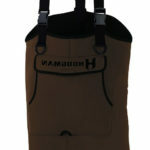 Neoprene waders are ideal when you plan on going duck hunting or fishing in colder waters. They are supposed to keep you warm, dry and in theory withstand challenges, where nylon waders would tear up almost immediately. If you need something durable to execute your hobby under unforgiving conditions, neoprene is what you want. The Hodgman Casters are made from 3.5mm neoprene, which is widely used and has proven to be a good choice. The first thing I noticed the moment I opened the package was a strong chemical smell. I am not exactly sure where it comes from, might be the rubber boots, because that is what it smelled like. So before doing anything further, I put the on hanger and hung them outside for one night. The next day the smell was not gone but slightly less pungent. Expect them to be smelly for at least the first week. Besides the smell the first impression was good. Seams, the first thing I usually examine, look well made and are “triple-strength”, in other words glued, stitched and taped. I gave them some tension by pulling adjacent pieces apart and I have absolutely nothing to complain about here. The 3.5mm neoprene is standard, Hodgman could not really fail with this and again, nothing to protest about. It will keep you warm and is pretty flexible. On colder days you will be happy to have this fabric on your legs. However as soon as days get warmer you will start to sweat, keep that in mind. If you mostly in the summer or in generally in warm temperatures take a look at the Hodgman breathables here. The Caster come with included knee pads. Certainly a plus since no matter if you fish or hunt, you will probably kneel every now and then and I had waders rip the moment my knee touched a sharper stone. This will not happen here for sure, at least not that easily. Neoprene will also let you move in the water without narrowing down your mobility. The fabric itself is flexible and even when it fits tight you will be able to move freely. Maybe you wore a wetsuit before while diving or surfing, then you know what to expect, the difference here is though, waders keep your legs dry. The fitting is decent, I read on Amazon that they run big so I ordered one size smaller which worked for me. They fit tightly but not too tight and due to the fact that they stretch a bit it gives them a slimmer look when you wear them compared to some other breathable or standard nylon waders. I like it! Bootfoot waders come with attached boots, the pair on the Casters are 200gram Thinsulate rubber boots and as mentioned before, they do their job and keep you comfortably warm. They come with cleated rubber outsoles, wool felt insoles. What I do really not like here is the depth of the boot tread. If you touch the surface of the front part of the sole it honestly feels almost like the braille. While I did not slip walking through the water you certainly notice, that the grip isn’t the best. Be careful here. Mentioned that, there is no wading belt included here, get one separately, don’t wade without one. The Casters come with several pockets, a classic chest flap pocket, bilateral hand warmer pockets and, what they do not mention on Amazon, another interior pocket made from polyester. The front pocket is generously sized therefor gives you enough room for some tackle. The suspenders are padded with neoprene, to make them more comfortable to wear and are plugged in by quick release buckles. I prefer this option over velcro as I found them to be more reliable. As always I tested them in a stream and when I say “tested”, I actually just fish for a few hours- what I would do anyway- and wear them during that time. I kneeled, I waded, I walked through some thicker brushes and after all they still look the same, do not leak and kept me dry. The insulation worked well and since it was a warm day I actually started sweating a bit from all that hard casting “work”. Not an issue because at the same time, I know they will keep me warm when it gets colder. Considering that we talk about an entry-level product, the only thing I can really criticize here is the boot tread. If you keep that in mind the Hodgman Casters are good neoprene waders for under 100$ and even for 50$ more they would still be good. 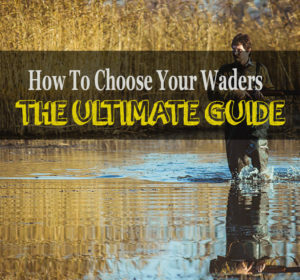 If you want neoprene waders while only having a limited budget, this will be a decent choice.